“There’s a Christmas Eve tradition in the Taylor household. 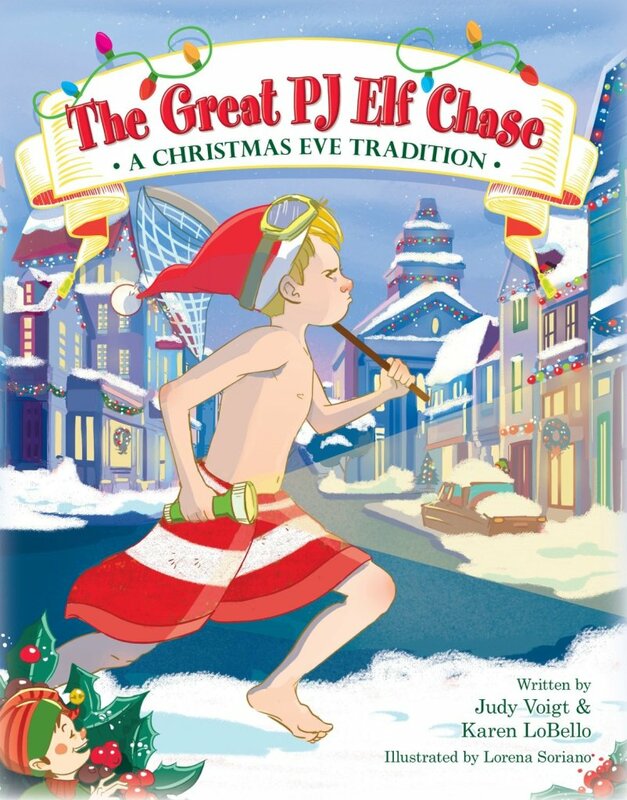 While the boys take baths, Santa’s elves drop new pajamas outside their bathroom door!” That explains the book’s title — The Great PJ Elf Chase. And once you catch on to the premise, it’s suddenly a lot more intriguing. There’s something fun about a children’s picture book that rhymes, and the book’s cover fills in the backstory. “The PJ elves are sly and quick, but this year they’re in for a surprise — Ben and Jack are on a mission to catch one of them! ” Away we go — the book starts with the two brothers making plans on the morning of December 24th — and their conversation is written entirely in rhyme. The crisp rhythm keeps things interesting — and the book instantly delivers more intrigue by switching from the two mischievous brothers to the elves who are watching them! With a crystal ball they track which kids have finished their baths, then when the delivery’s a go, send a specific team of elves to the children’s address at the appropriate time. I like how the book shows both sides of the story — and at one point, you even see the elves snickering under the boys’ bed! Will the little boys outsmart the elves? They’ve hidden cheese in a box labeled “Trap #1”, and enlisted their dog McGee to keep watch over their door. But there’s a rambunctious energy on both sides, since these elves also like to mess up each family’s house. It was a family tradition for the book’s authors, two sisters who remember that growing up they always had a lot of fun each Christmas — regardless of how many presents were under their tree. And they’ve worked their memories into a story that’s surprisingly exciting — with a funny twist at the end. Young Ben won’t give up, and he hunts after those elves — running outside in his towel! It’s a snowy day, but soon Ben discovers that he’s got an even bigger problem. ” ‘Oh my gosh! This can’t be!’ Ben must hide near a tree. His bath towel is gone — did the neighbor girls see?” Children will probably enjoy laughing at the end of this book — and the little boy who was just a little too anxious to catch the PJ Elves.